camping sites where they fished and hunted, then returned to inland sites for the winter. Uncle Frank told the camp at the opening council fire that those Indians often left some of their tools or other gear at the summer site, then they would uncover the cache and re-use those materials the next year. In camp Uncle Frank prepared a special box, painted brick red and decorated with a canvas band covered with Indian symbols. That has been our “Indian Box” for many years. 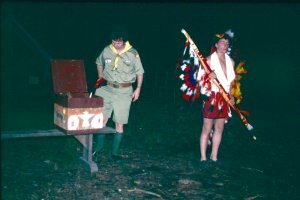 To keep the Indian tradition alive, Uncle Frank, in Indian costume and accompanied by at least one staff member similarly dressed, would open the box and return to each staff department and campsite the item which they had left the previous year. Some of those items were inside jokes referring to things that went on in camp, some were program equipment which would be used again, and all were the bearers of happy memories. At the final campfire in August, each staff section , department and campsite continued the tradition by adding their memories to the box, which was put away until the following summer. 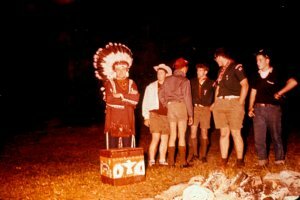 As troop camping replaced provisional units the meaning of the box began to be forgotten, since most of the troops in the first and last weeks of the season weren’t really in on the tradition, so in the seventies the ceremony of the box was transferred to the first and final gatherings of the camp staff.